My Nan, she retired as I was born, she taught me to knit, make jewellery and was always there when I needed her, she made me costumes for plays at school, she made THE best bread pudding. She had the loudest snore and laughed so hard she nearly wet herself. She never got to meet Asa or see us get married and never met any of my children, but I think of her every day. She was a huge influence on my life and I will always love her loads. As a very big thankyou for reaching 600 facebook followers, I promised a glitzy comp, well, here it is, your chance to win £50 of vouchers to spend at www.glitzysecrets.com . They have a superb range of bridal accessories, or if you are not tying the knot, there are some lovely sparkly things for you to enjoy. Please leave a separate comment for each entry, and don't forget to leave contact details, so that I can let you know if you are a winner. As mentioned in previous posts, my children love the outdoors, and they spend a lot of time in our garden. I was extremely delighted to be given the opportunity to review an item from the fantastic Garden Games. The game that we were sent to review was a Giant Connect 4, which is perfect for our children as they adore the game in normal size, you can imagine their glee at having it giant size! I have always loved the game, even more so when I met my husband, because his uncle is the person responsible for designing this game, so it has a special place in my heart. A large box arrived and we excitedly opened it. I do not know quite what I was expecting, but the product far outweighed my expectations. It is a very sturdy piece of equipment, that will last a very long time. It took no effort to piece together, just slotting the two end pieces into thew board and sliding in the bar at the bottom to hold the counters in place. The children had great fun unwrapping each individually wrapped counter and sliding them out of the grid. They had great fun fitting all of the counters into the very handy bag! The whole family have enjoyed playing with the Jumbo Connect 4, even in this weather! So I am sure it will be a firm favourite during the summer months. It is suitable for all ages, Eowyn had great fun just putting the counters in and making pretty patterns, the older children got quite competitive, although nowhere near as competitive as mum and dad ! For more information on the Jumbo Connect 4 visit Garden Games here. They have a fantastic range of outdoor games, trampolines and some amazing Playhouses. I would definitely recommend the Connect 4 and also the site. One of my New Years Resolutions was to try and save money and to help the environment a little more, so I have begun by ensuring I tie my food shopping trip in with a school journey, therefore one less car journey each week (who am I kidding, probably three a week!) I did consider stopping the children eating - that would save me a fortune, but they didn't seem to like the idea !!! Another was to consider changing Tyrus into reusable/cloth nappies. Each of the other children have always been in disposables, and thinking back I really have no idea why I didn't consider reusable nappies before. Since starting this blog and being in touch with many different mums and baby outlets, I have begun to look into the change, Tyrus also seems to have quite sensistive skin and the edge of the nappies always look uncomfortable, although that could just be his rather chunky little legs!! After getting lots of advice, I have purchased a number of different preloved ones﻿, so that we can give them each a try and see which ones we like the best, so fingers crossed that it will all work out!! Along with the nappies I have decided to make the switch to reusable wipes, my washing machine is permanently on, so it makes sense to just include the wipes in with the daily wash, and there are so many cute wipes out there, it seems a shame not to use them, I always find the scented wipes too harsh for Tyrus and the unscented really smell of nothing!! One Born Every Minute : Six very different births. The birth of a baby really is a special time, so I would like to share briefly with you, my six different births. Our first baby was due 6th May 1998, but on the morning of 28th April at 5am, I woke up feeling dreadful, a stinking headache and feeling dizzy, I rang the hospital who told me to come in and get checked, Asa was very calm at this point. although he didn't drive, so I took us both off to the hospital, just to get checked out, by 7am I had seen the consultant who had said I was to stay in and be monitored, Asa dutifully phoned everyone to tell them what was happening, no sooner had he done that then the next consultant changed his mind and said my blood pressure was rocketing, and I had begun to get rather puffy looking. So I was to be induced that very day! I was given my first dose at lunchtime and Asa and I walked around the hospital grounds, I just remember feeling quite chilled and relaxed. As the contractions began to take hold I had an epidural and Asa was with me throughout, giving encouraging words and at 7.49pm our first daughter Xene was born, Asa was amazing throughout and got quite emotional when she was born. At 8am I took Asa into the hospital, I received a phonecall at 1pm to say he would be ready to leave as soon as he had eaten something, I arrived at the hospital to find him just finishing a Cheese and Tomato sandwich (funny what things stick in your mind!) and reading a newspaper, he was trying to look so completely alert, the only problem was that his newspaper was upside down!! He really wasn't with it at all!! At 2am I really felt like the contractions were getting quite strong, I called for ther midwife who casually came to check me and was suddenly met with "Call Mr Morrison and get him back up here quickly! " 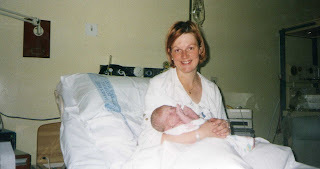 I was 7cm dilated, they wheeled me round to the delivery suite,. Asa arrived 20 minutes later, looking like he had been out on the town all night, he needed something to eat and drink and went off in search of the vending machine, he had been gone for what seemed like ages, and in the end the midwife sent a porter to locate him, as I was about to give birth!! 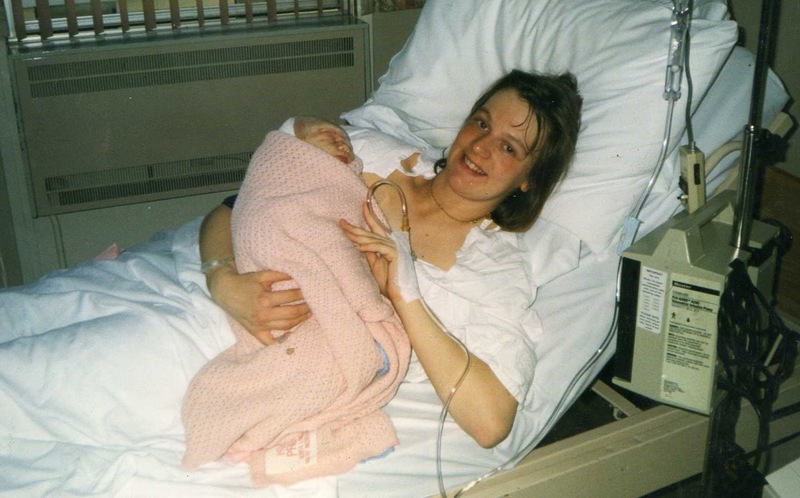 Our third baby was due on 12th April 2003, that day came and went with no sign of a baby making an appearance, the next evening I felt slight contractions, so we called Asa's parents, who were on standby to come over and stay with the other children. Very quickly the contactions increased, I can vividly remember changing our bedcovers in between contractions, I phoned the delivery suite and told them the contractions were 2 mins long with only 90 seconds breaks, the midwife on the other end of the line said they didn't sound that strong (they did to me!) but to come in when we were ready. Birth number five wasn't quite so dramatic, due on 3rd December 2008, I finished work on Wed 26th Nov, the following day I felt a large wet patch and was sent off to the hospital to be checked, they were unsure if my full waters had gone or if it was just the hind waters, I was sent back home and told to come in Friday morning at 9am. Asa's parents turn for the birth babysitting, so I got the older children up ready for school and we waddled off to hospital. When we arrived there were no bed spaces so we toured many different parts of the hospital whlist waiting to be seen. Eventually we were given a room and the contractions took hold, Eowyn was born at 8pm and we returned home six hours later to a very happy family. 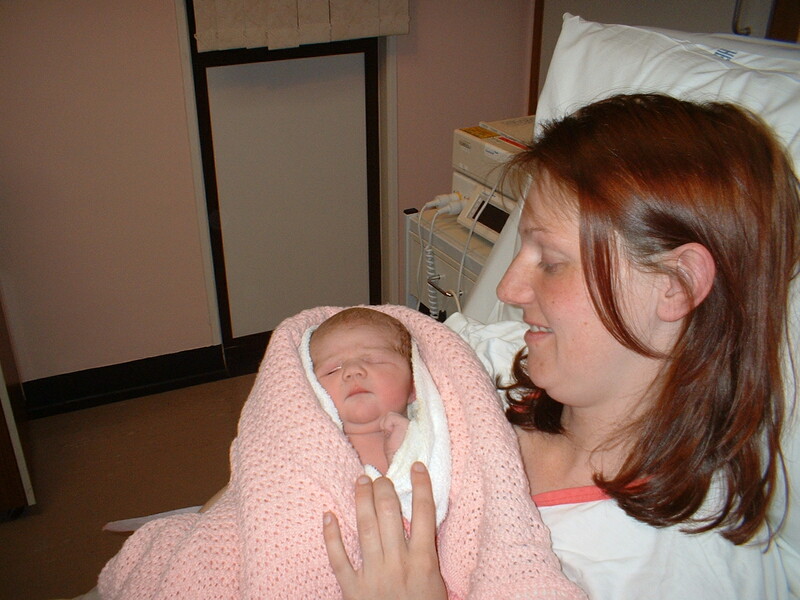 Birth number six was slightly different because I opted for a home birth, the last three births had been straightforward and I hated being away from the other children, waiting at the hospital for the obligatory six hours after the birth. Baby was due on 13th June 2011, however on 10th June at 5am I found myself wide awake and feeling a little uncomfortable. I got up and made myself a drink, I then thought I had better telephone to let the midwife know, I suddenly had visions of her turning up with my kitchen full of dirty dishes, so I proceeded to unstack and stack the dishwasher (funny little things go through your mind!). Asa suddenly came charging down the stairs, he had turned over and found the bed on my side cold and empty, he said he had visions of me giving birth downstairs alone, I reassured him that he would definitely have been woken if that was the case! In between contractions I made the four older children's lunch boxes, and ensured they had everything they needed for the day. Asa took the children to school with a slightly worried look on his face, and I assured him I would wait until he returned to have the baby!! Asa came through the door at 9.10am and amused Eowyn and kept popping in to check I was OK, by this point I had two midwives and a student midwidfe, in fact more people than I had ever experienced during my previous labours, it was wonderful and THE best experience ever. Asa was able to come and go, without the need to be at my side throughout, because as he says there isn't that much the man can do. It was wonderful being able to be in my own home, surrounded by all my belongings, knowing that everything was available. Asa says that it was the best birth he had been at, purely because he got to spend so much time with Tyrus when he was born, the entire time that the midwifes were doing my checks and making sure everything was OK, he got to spend the time bonding with Tyrus and being with Eowyn too. It was amazing to watch all of the other children come home from school and be welcomed by their new baby brother. This post has been linked up to the One Born Every Minute post on the blog for Netmums . Happy New Year at last ! At last my internet seems to be staying connected for more than ten minutes! I guess you don't realise how much you need something until its missing, as in the case of the internet! We have been without for a little over two weeks on and off, some days it would work, others absolutely nothing. It seems to have sorted itself out-I hope. New Years Eve for us was very enjoyable, we seem to have settled into a pattern of staying home with the children, playing lots of games and having a little party type buffet, which they all love. I am not one for going out without the children on New Years Eve and there aren't really many places around our area that you can take children, so this shall be our standard New Year, at least for the next couple of years until the older children decide to go out partying!! As you can imagine, with six children, play space is quite limited, although we are fortunate enough to have a huge garden, it doesn't get used that much in the winter. Although we have six children, they are all inidviduals, therefore I don't think it is fair that they miss out on playing with certain large toys, just because there are more of them than the usual family, so I was extremely excited to be given the opportunity to review a Cardboard Pop Up Playhouse, it sounded perfect. A playhouse for Eowyn to practice her Role Playing skills, without the hassle of a large cumbersome Playhouse to take up lots of room. Cardboard PopUp House is a fantastic idea, it takes just 10 seconds to erect and it can be taken up and down as required. It is also very educational with numbers and letters on the walls. The children had great fun colouring in the roof . Eowyn and Neva insisted on putting some Tinsel on it and hanging the stocking Eowyn had made at Preschool. As you can see, it is a very roomy house and they had great fun playing in it over the school holidays, and once the Christmas Season has finished, the wrapping paper can be removed and it is back to a playhouse, and even better, it can be folded away when not in use, a truly inspired idea, and one I shall definitely be telling Eowyns Preschool about, who have a space issue, but the children love playing shops and houses. For more information visit ﻿http://popuphouse.co.uk/ they have some great choices and all environmentally friendly. Christmas in the Morrison household is quite a busy affair, with six children there is a lot of noise, chaos, fun and enjoyment. I was very lucky this year, because Asa was able to have the entire Christmas Break off from work, which enabled us to get ready for Christmas in a sort of calm manner!! The wrapping took me approximately 36 hours in total, over a period of four days, next year I shall attempt to wrap as I buy, but I am sure that won't happen!! A tradition in our house is to go out for a walk on Christmas Eve, the children get some fresh air and I like to think it helps them go to sleep quicker at night!! After a few attempts at balancing the camera on the flask of Hot Chocolate, we managed a photo of the whole family, which doesn't happen very often! We had a lovely walk to the Roman Fort at Burgh Castle. Christmas Eve, the children put out a Mince Pie and a glass of Milk for Santa and a Carrot for the Reindeer, they also sprinkled Reindeer dust on the patio so that they would know where to land. Christmas morning arrived and I was amazed that they all slept in until 8, which was lovely because it meant no grumpiness later in the day due to tiredness. All six children came and opened their stockings, well I say six, the other five gave Tyrus a helping hand!! Once our bedroom had been filled with lots of wrapping paper and various stocking items, the children were eager to go downstairs and see what Father Christmas had left. Every year we take a photo of the children at the bottom of the staircase, and every few years, another child has been added, it was quite a poignant moment, as I am pretty sure this will be the last Christmas we see a new addition to the family. ﻿We finally finished opening presents about 10.30am, everyone was extremely pleased with their gifts and they all received what they had asked Father Christmas for. Next was the job of getting Christmas Dinner ready for eighteen, which included eight of us, both sets of parents, my sister and her husband, and Asa's sister, partner and our two nieces. Dinner was being eaten at 3pm, all guests arrived at 2.30pm, leaving just enough time to exchange gifts, and serve the food.